To those outside of the search marketing industry, or those that are new to it, content marketing can appear a little woolly – a practice big on ideas, but short of facts – but proof of concept is there for those who look for it, and there should be an immediate distrust of anyone who simply answers ‘it’s hard to measure’ when asked for results. Though there are certainly more metrics and methods of monitoring your content marketing progress than will be shown here, but the following should provide the basics to track the success of your brand’s content, allowing you to build on the data gathered for future campaigns. Here we’re going to take a look at sessions that take place on-site, though we’ve dealt with utm tracking elsewhere, and look at what analytics can tell us about content performance at a glance. 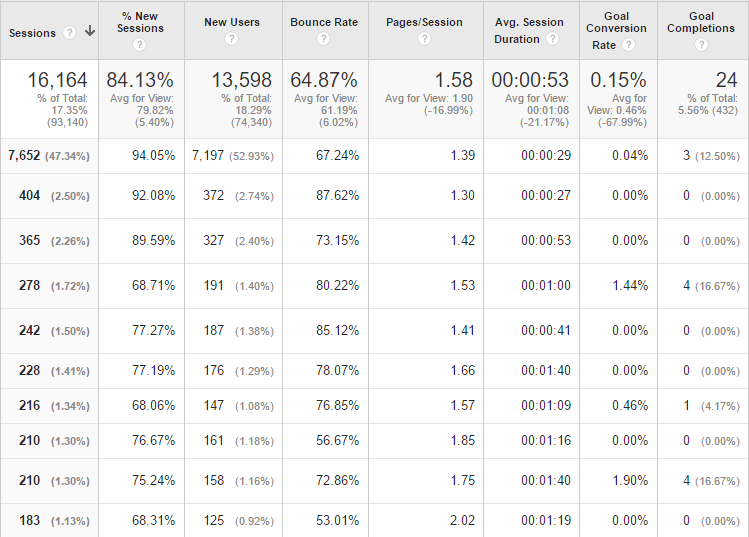 Top level metrics for landing page analysis. The above, for example, shows some of the best metrics for measuring the success of your content (and included in the standard view if you follow Reporting>Behaviour>Landing Pages) and is an average of all pieces in the selected area of the site for the selected duration of time. Sessions: – Sessions is total number of visits to the specified subsection of the site (here reached by searching ‘/blog’ to give a view of blog traffic). It details the overall number of visits, including returning visitors. It has the obvious benefit of indicating your overall traffic – and if tracked in the graph commonly found above this table, it can show how much your traffic improves alongside a content strategy. % New Sessions: – As above, but this metric excludes returning visitors and so is able to give you an indication as to the new consumers your content is attracting. Clearly it is desirable to retain some repeat traffic as it indicates that your content is developing a following, but this metric can offer a fantastic insight into how your content is developing your traffic. New Users: – This is the number of new visitors, rather than as a percentage. Easier to parse at a glance as a simple figure, this metric shows how attractive to new audiences your content is – perhaps revealing how well a piece of ‘How to’ or instructional content is answering the search query it is aimed at for example. Bounce rate: – This is a great metric for measuring how well your content feeds in to other pieces – showing the percentage of users that visit only one page of your site before exiting. 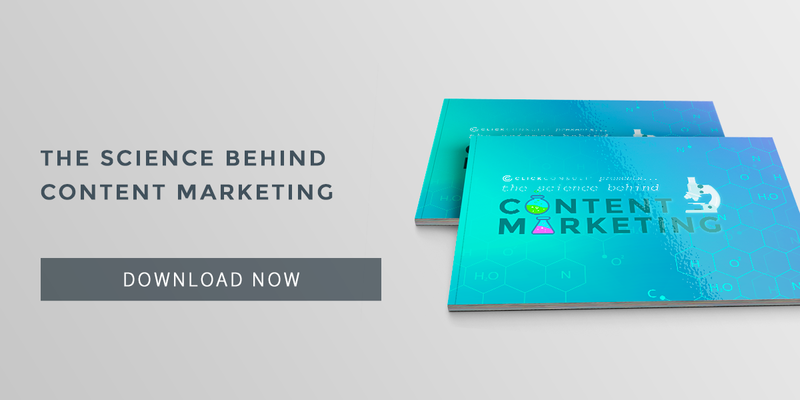 It can also show you how well your ‘similar content’ lists or CTAs are working, as these are the main tools you will use to draw consumers on through the site as part of your path to conversion. Pages per session (PPS): – This offers an insight into what consumers are doing on your site and potentially how well you’re capturing their attention. PPS will generally be much higher for eCommerce sites, but equally a site looking to measure the success of a content strategy will want a high average as it indicates that they are continuing to read/watch/listen past the point of finishing what originally drew them to your site. Avg Session Duration: – The ideal length of this will depend upon how long your individual pieces of content are and how many pages per visit your consumers are visiting, but again the best result is always longer. If a piece of long form content is only receiving a minute of attention, for example, it may be worth revisiting the page to see if you address any issues with the content or layout. Goal Conversion Rate & Goal Conversions: – Again, these will depend on what goals you have in place, how you’re using CTAs in your blog and other things, but essentially these metrics allow you to assess at a glance how well your content is performing against specific goals – which can, again, be tracked over time to measure progress and identify areas for improvement. Some example blogs arranged according to sessions. Though we would recommend a more thorough method of attribution modelling, as a quick overview the standard first and last interaction attribution can give you a good idea of how your content is performing across various platforms. The below, for example is an example of conversions for which the first interaction was a share on various social platforms (for ways to increase your insight into specific content, see the social dashboard available in our social media toolkit). Here you can see which platform is serving your present content strategy best with a view to rethinking approaches for platforms which are underperforming, specifically looking to adapt content to the forms of content which perform better on that specific site (see our guides to Facebook, Twitter and LinkedIn or social media infographic). First interaction is indicative of a conversion which began with a specific referral from (in this case) a social referral and, though there may have been many interactions since, the cookie was placed during this particular visit and the conversion took place within a range of time which can be personalised to the brand – so ensure you calculate the standard lifecycle of a conversion to ensure accurate reporting). Similarly, last interaction shows the number of conversions and their value from visits with a last interaction before conversion that have (again we use the social channels here) come from various platforms. Though the value of these conversions is obviously important, the main use of this section of Analytics is to monitor the performance of and assist with the furtherance of your content strategy. You can draw inference from various performances, and look to capitalise on success and improve on underperforming channels. There are, of course, many other ways to monitor the performance of a content marketing strategy not just on Google Analytics, but with several other third party tools (and some of the platform specific analytics offerings), but with just these few Analytics views (and a record of where content is being shared and when) you can learn a lot about the progress of your strategy. There is, therefore, never a need to take ‘it’s hard to measure’ as an answer from your agency or content team, if done well and monitored regularly, there is a lot to learn even at a glance that will instruct and inform. To find out how Click Consult can help maximise your content marketing potential, contact us today, or for more information visit our resource page or blog.